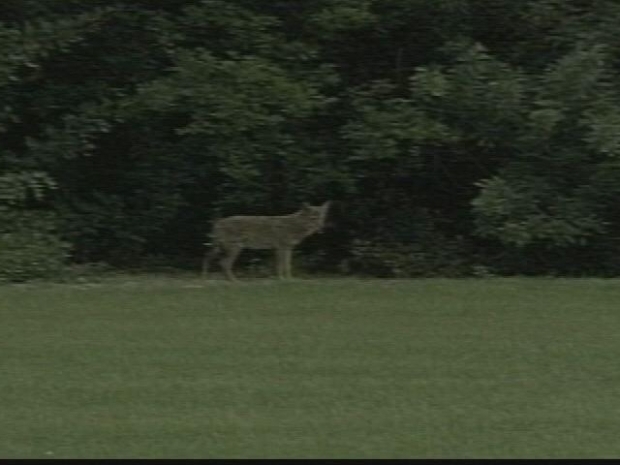 It's Fox Hollow, not Coyote Hollow, but the condominium complex in Windsor Locks has some unwanted residents -- coyotes. "I've actually brought out a baseball bat," Kathy Dymersky said as she walked her dog, Tucker. "Especially in the evening, when I can't see them as well as the daytime." Tucker hasn't seen a coyote, but if he did, Dymersky's afraid he'd go after it, even though a coyote would outweigh him by at least 25 pounds. Jasmine, a Japanese chin, hasn't seen a coyote either, but her owner, Mattie Murray, said, "I won't take her out back at all. When it's dark, I only go in the area here in the driveway." More and more coyotes are turning up in residential areas of Connecticut. Just last week, someone spotted a coyote behind her condo. "I saw one maybe a year and a half ago, on the road. It disappeared when I drove toward him," said Joan Jordan. "I do believe they're here because one of my neighbors said he's seen three of them last week, drinking in the river over there. I look over my shoulder every time I walk outside," Richard DiPasquale said. There's a warning posted at the community's mailboxes, advising people to keep away from coyotes. If you have photos of animal sightings, send them to us by e-mail here.